Product #6081 | SKU 3308H00010 | 0.0 (no ratings yet) Thanks for your rating! The AKG WMS 470 Sports Set Wireless Headworn Microphone System delivers quality, reliable wireless transmission, flexible features and intuitive control for cable-free guitar playing and other instruments on stage. 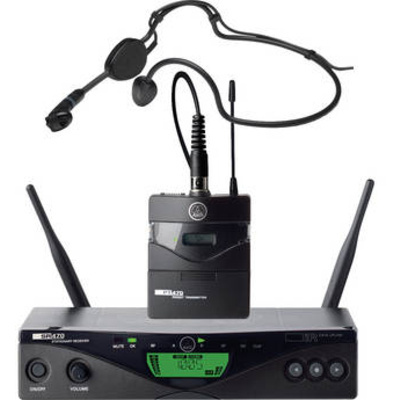 The WMS 470 Sports Set consists of the SR470 diversity receiver, PT470 bodypack transmitter and C 544 L headworn microphone. The C 544 L headworn microphone features a rugged headband that wraps behind the neck. Its moisture shield protects the cardioid element from perspiration and humidity, making it an ideal choice for aerobics instruction, coaches and more.